Also known as Swiss chard or silverbeet, chard is a hearty green with a mild flavor resembling spinach. It is a member of the beet family. Chard is a good source of vitamins A, E, and E, as well as minerals such as iron and calcium. 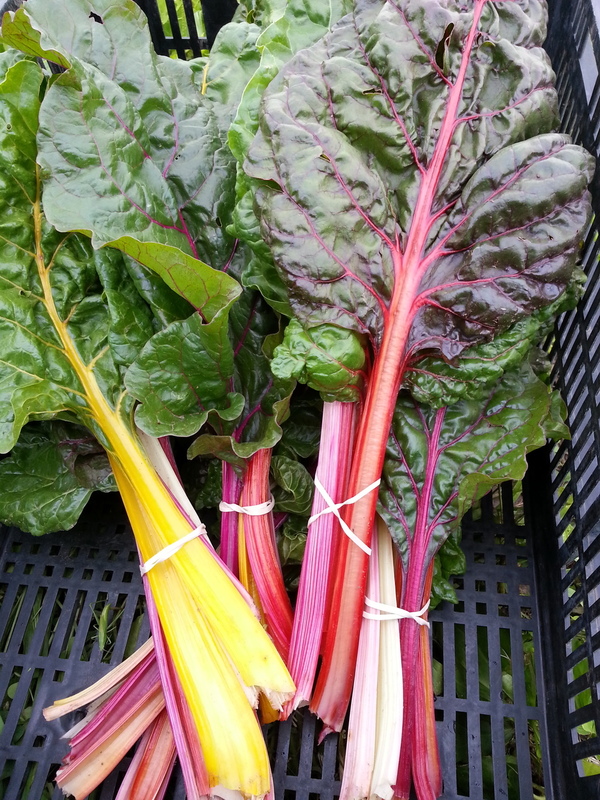 While chard is best fresh, it will keep for a few days in the refrigerator (wrap in a damp towel or plastic bag and keep in the hydrator drawer). Chard can also be frozen. Chop leaves and blanch for 3 minutes. Next, rinse under cold water to stop cooking, drain, and store in an airtight container (e.g., zip-lock bag) in freezer. Though small leaves can be cooked whole, for large leaves, stems should be removed and cooked separately (for a longer period of time). Cut leaves away from stems, and chop stems into approximately 1 inch sized pieces. Start cooking stems about 5 minutes before adding leaves. Cook until leaves are wilted.